Home Dicots On Dr M’s Golden Pond – The Solution! On Dr M’s Golden Pond – The Solution! OK it’s not golden and it’s not a pond! 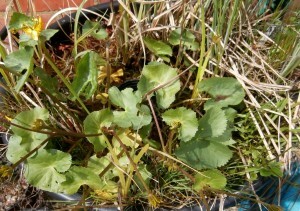 Rather it’s a large water-filled plastic flower pot stuffed with aquatic plants! 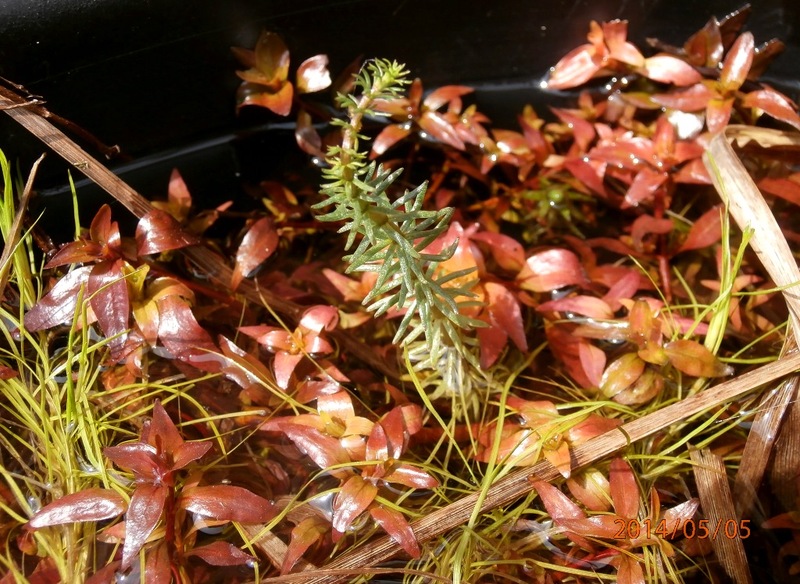 But recently Dr M posted about this “pond”, and despite its diminutive size, there are quite a number of plant species living happily in it at the moment and Dr M presented images of six aquatic plants for your examination and identification. If you haven’t done so already, check out the original post here and see how you get on. OK so ID’ing plants from photos is not ideal, and there were some critical ID features missing or hidden, and even some whole species hidden! Yellow, buttercup like flowers (actually petal-like sepals, there are no true petals in this species!) leaves are cordate and kidney-shaped, carpels develop into fruits which are sac-like follicles containing the achenes. Leaves are strongly toothed (once you get your eye in, this rather characteristic type of serration is found in the leaves of many Rosaceae). The lower leaves are pinnate (as in the picture) but the upper stem leaves are palmate to trifoliate (check in the picture right hand side). 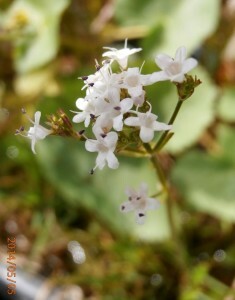 The white tubular flowers have 5 petals and are grouped in terminal heads (inflorescence is a branched cyme) and there are separate male and female plants – i.e. the species is dioecious (hence the specific epithet: dioica) so look carefully at the featured image at the top of this post and you will see male flowers with 3 anthers and female flowers with 3 stigmas. 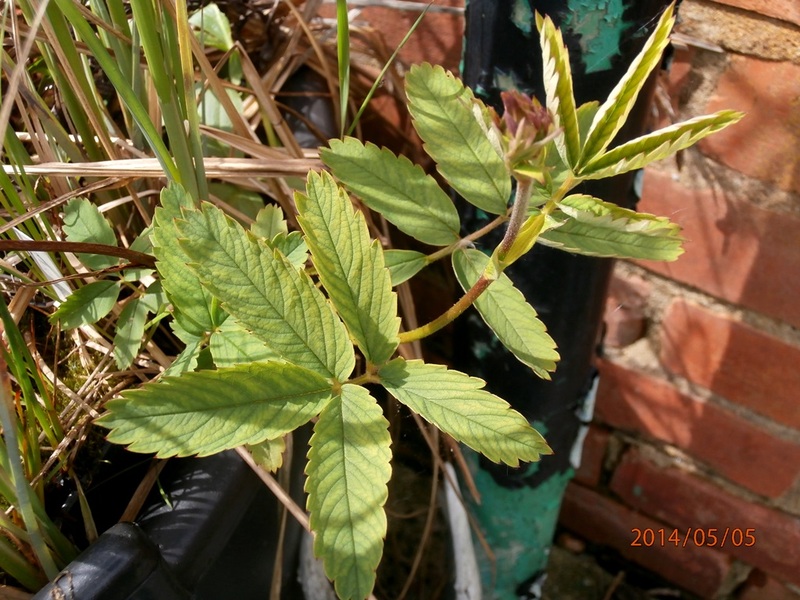 The basal leaves are undivided, the stem leaves are opposite and pinnatifid (not visible in the picture). OK there are several plants here, but Dr M thinks there is only one plant that looks at all like a tail! It is a characteristic unbranched plant with erect emergent stems and submerged trailing stems (can’t see these in the picture), the leaves are in dense whorls. NB: All the other leaves in this picture are from different (mystery!) plants, go on have a go, you know you want to! OK, now to plants E and F, and you may have noticed that they are monocots (they have linear leaves with parallel venation), and noticed (or guessed!) that they are from the same family, but which family? Well they are clearly grass-like plants and there are three main contenders: Poaceae, the grass family, Juncaceae, the rush family and Cyperaceae, the sedge family. Grasses have nodes right down to the ground! OK so how does this help us? Well look carefully at the pictures E and F (click on the images once, then again to get the most helpful close-up view) and you should be able to tell that the flower stem is NOT round (so not Juncaceae), and it also does not have any nodes (nodes in grasses are little knobbly knee-like structures on the flower stem, don’t know what a grass node is? check out here). So by process of elimination they must be Cyperaceae, and they are! 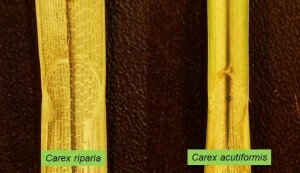 In fact they are both in the genus Carex, the true sedges. And as the rhymelet says: Sedges have edges, this means that the the flower stem is triangular in section and the leaves are arranged in 3-ranks (one coming from each side of the triangular stem, as opposed to 2-ranks in grasses). Sedges (like grasses) are traditionally thought of as a “difficult family”, so much so as to induce “Cyperophobia” in some students (fear of sedges!). But, Dr M says don’t be botanical wimps or wusses, just keep you eXtreme botanical nerve and get stuck in and you’ll find them fascinating, rewarding and beautiful (in a Cyperaceous kind of way!). There are about eighty different sedges in the British flora, (I won’t mention there are hybrids as well!) 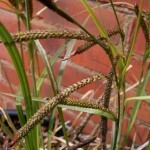 and to tell which sedge is which, vegetative as well as floral characters are useful. Vegetative characters include leaf size and colour (especially whether the leaves are shiny or glaucus (grey-green). And, like grasses, sedges have a ligule, but they are a bit different to grass ligules. In grasses the ligule is a sticky up flap membranous flap, but in sedges the ligule is “adnate”, which means it is fused, i.e. stuck, to the leaf blade for most of its length with only a tiny bit sticking up. 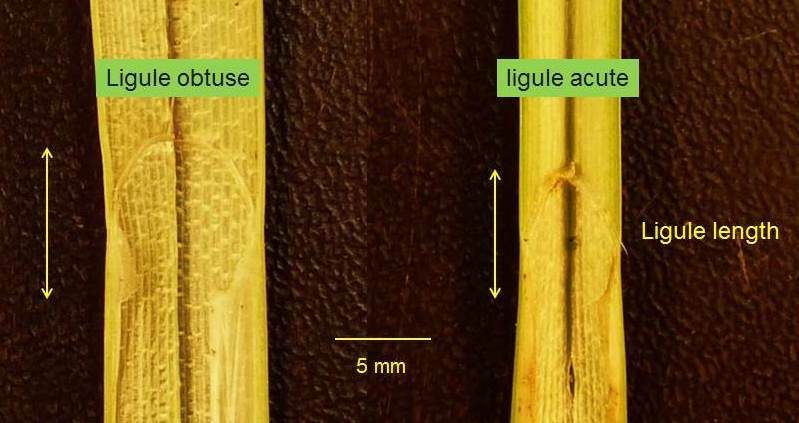 The length of the sedge ligule is an important character, and here you DON’T measure the tiny sticky up bit, instead you measure the longer, FUSED bit, from the base to the tip. Ligule shape is also important and it may be pointy (acute) or rounded or blunt (obtuse). Sedge flowers are very reduced and simple and floral characters include the number of stigmas (which is either 2 or 3 depending on species) and the size and shape of the special flask-like sedge fruit, known as the utricle, and the size and shape of the associated scale-like appendage known as the glume. So which sedges have we got here? 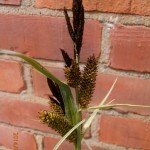 Large sedge with erect spikes and large utricles 5-8 mm long with a beak 1-2 mm long. Leaves 5-24 mm wide, glaucous above with scabrid margins. 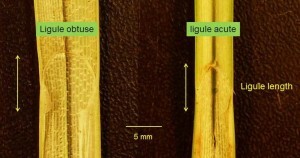 Ligule obtuse and 5-10 mm with a 0.6-0.8 mm free margin. Sheaths with 1.5-3.5 aerenchyma blocks (aerenchyma is tissue with tiny air hollows and a common character of aquatic species). Medium-large sedge with pendulous spikes and utricles 3.5-5 mm long with short beak 0.3-0.8 mm long. Leaves 7-10 mm wide, glaucus above with very scabrid margins, ligule acute and 7-10 mm with a 0.3-0.4 mm free margin. Sheaths with 3-8 mm aerenchyma blocks. 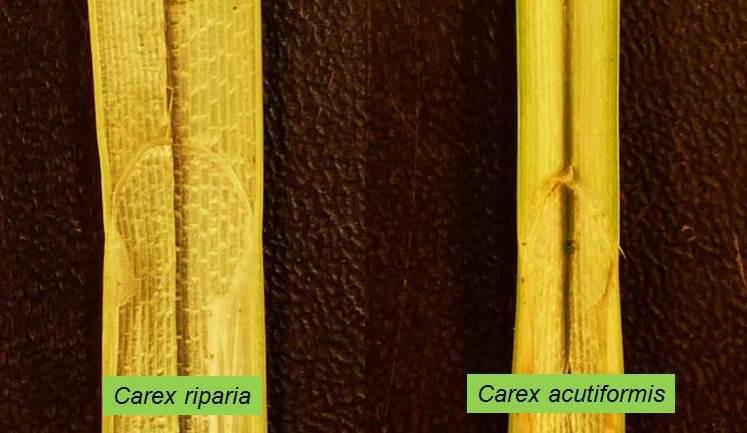 The images below show the leaf blade and the ligule for these two species and you should be able to check out the ligule characters mentioned above, make sure you know how to measure the length of the ligule in each case. So E and F are both sedges, and pond sedges into the bargain, so evidence that Dr M’s large, water-filled flowerpot IS actually a pond afterall! Well in the minds of two large Cyperaceae at least! Dr M is particularly fond of sedges and promises more Cyperaceous postings in the future! Dr M says: There’s more where they came from! There are one or two other plants visible in the images (at least two more monocots and one dicot for example!) so if you spot any over and above the six described above do get in touch!